The last time we visited Kew Gardens, in 1988, we had been advised by my brother to "be sure to see Kew's hidden treasure, The Marion North Pavillion". 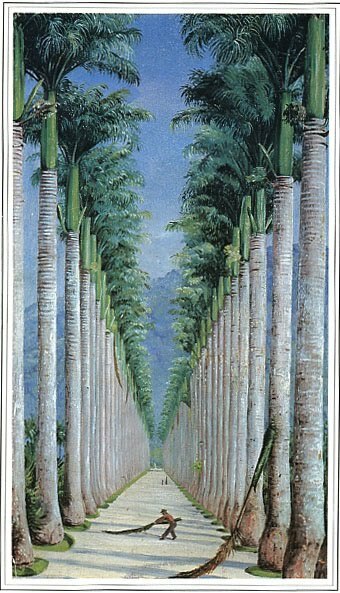 Our holiday was coming to an end and time was precious, but we did find the exquisite bijou gallery, commissioned by Marianne North in 1879 to house her life's work, more than eight hundred oil paintings of the flora of this planet. We spent more time there than we had intended. We were entranced by the intensity of the place, but our holiday was coming to an end and we couldn't stay. We bought a book "A Vision of Eden, The Life and Work of Marianne North", and came away. The book, now out of print, is still one of my treasures. Valerie Greeley's recent blogpost http://www.acornmoon.blogspot.com/ about her October afternoon visit to Kew sent me to my book shelf to enjoy a nostalgic browse through the pages once more. From my reading of Marianne North's life, 1830 to1890, it seems to me not that she defied the conventions and restrictions of her time, but that she was indifferent to them. She was a single woman in possession of a fortune and, unlike Jane Austen's impecunious heroines, was certainly not in need of a husband. It must have helped to be the child of wealthy, cultured, perhaps somewhat unconventional parents. Their three children - Marianne was the eldest - were not relegated to life in a nursery dominated by a governess. They lived and travelled with their parents and met most of the eminent people of their day. In her memoirs,"Recollections of a Happy Life" Marianne wrote of her childhood, "We had much variety in our life, spending the winter at Hastings, the spring in London, and dividing the summers between my half-sisters old hall in Lancashire and a farm-house at Rougham, Norfolk". The family also travelled widely in Europe. Marianne was dismissive about her education. "Governesses hardly interfered with me in those days. Walter Scott and Shakespere gave their versions of history, and Robinson Crusoe and some other old books my ideas of geography." 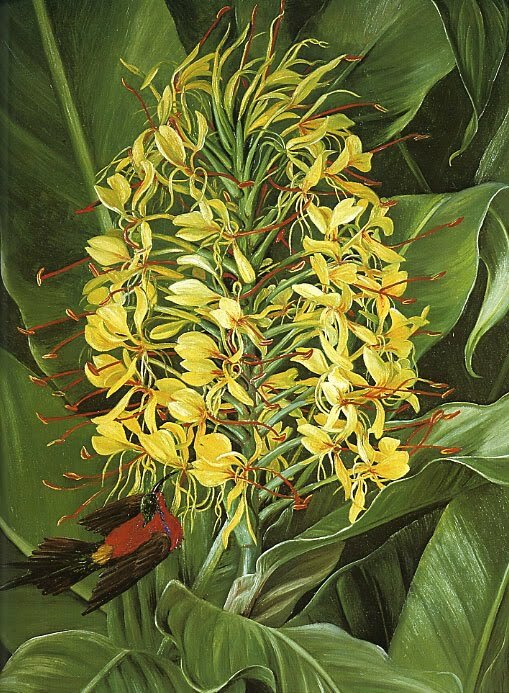 Even so, Marianne was a talented musician, she continued her study of music into her adult life, she was an avid gardener with a keen interest in botany and an accomplished artist. 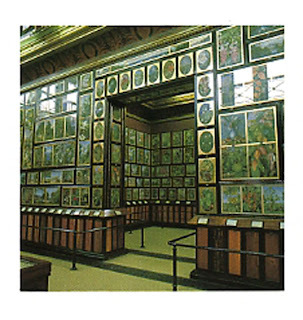 She filled sketch books with her paintings and drawings of the places the family visited on their travels. This idyllic life changed over time, inevitably, as family life does. After the death of her mother in 1855 and the marriage of both her sister and brother, Marianne became mistress of her Father's household. This was not a burden, they were devoted companions and continued to travel together until his death in 1869. He died in her arms. 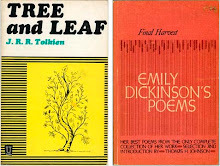 She wrote, "for nearly forty years he had been my one friend and companion, and now I had to learn to live without him and fill up my life with other interests as best I might". With vision and practicality Marianne worked her way through her grief and created a new purpose for her life. 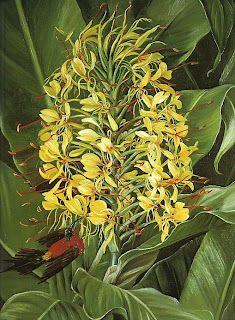 She would continue her life of travel, painting and sketching the scenery along the way, but she would expand her horizons and focus on creating a visual record of the plants and flowers of the world in their natural environment. This she did for the next seventeen years until she was overtaken by ill health. 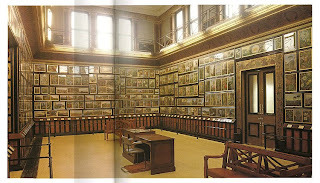 The beautiful end papers in my book are highlighted with the places Marianne North visited. They include India, Chile, Canada, Tasmania, Japan and others too numerous to list here. assistance or accomodation she needed along the way. 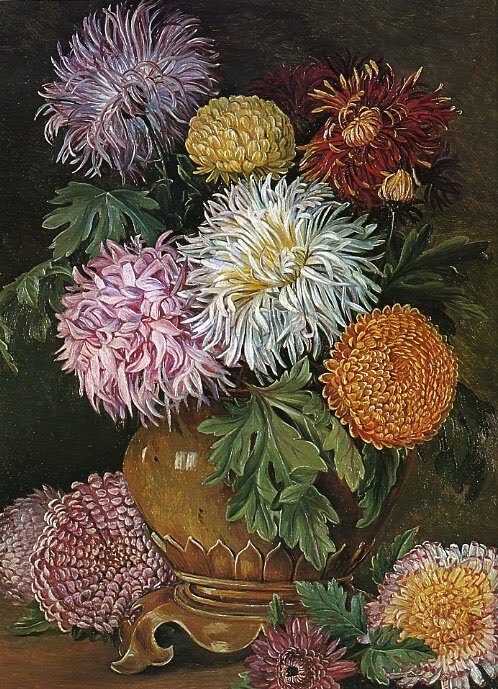 When she returned to England after her last voyage in 1885, despite continuing poor health, Marianne supervised the completion of the gallery she had comissioned at Kew and the installation and arrangement of her paintings. After that, her mission complete, Marianne sought out the perfect small country house in which to live her old age. She settled in a house in Alderly in Gloucestershire and there turned her diminishing energy to re-designing the lush overgrown garden. She added a little walled rose garden, a pond and a rockery. She wrote in her memoirs, "The recollections of my happy life will also be a help to my old age. No life is so charming as a country one in England, and no flowers are sweeter or more lovely than the primroses, cowslips, bluebells and violets which grow in abundance all around me here". She died on August 30th 1890. Her generous gift and vision enrich us today. The Marianne North Pavillion at Kew Gardens was closed for restoration of both the building and the paintings for much of this year. It is open again now. 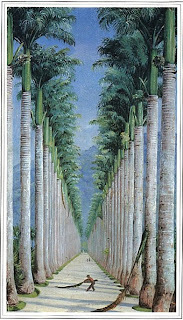 If, like me, you cannot make the journey, you may enjoy an amazing virtual visit at www.kew.org/collections/art-images/marianne-north/index.htm . 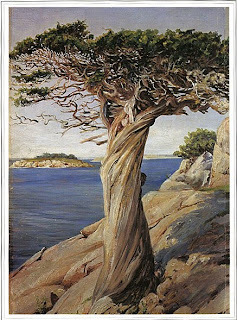 A new illustrated biography, "Marianne North, Intrepid Explorer", is in the works and due for publication next spring. Too late for Christmas but I will put it on my birthday list. 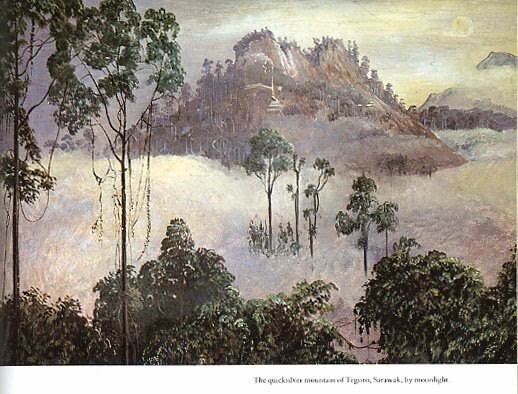 All the pictures on this post are from the book "A Vision of Eden, the Life and Work of Marianne North". I really enjoyed reading this and learning more about her life. She achieved so much in her lifetime and has left such riches for us to enjoy. 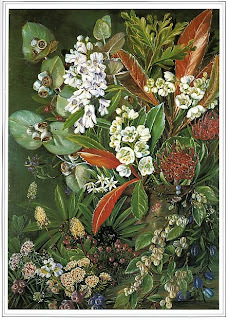 It was interesting to read that she loved, above all, the wild flowers of England. I am enjoying Grandmother's Tree very much and look forward to sharing it with my grandson when he is a bit older. Thank you for signing, I shall treasure it.